Noah Witherspoon, the developer behind the current #1 application on the App Store, has revealed that Tris [Free, App Store] will no longer be available as of Wednesday, August 27th. 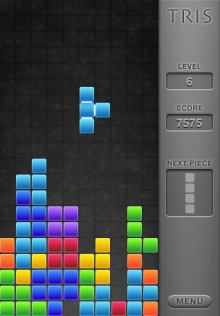 The Tetris-clone caught the attention of the Tetris Company who claims a "copyright" claim on the game. The trouble is, I'm a college student, and not an affluent one, and I simply do not have the time, energy, or resources to fight this battle right now. There's a point at which I am willing to give up and be practical, to let the world have its way with that ever-mistreated little ideal of principle. Thus, it's with great sadness that I must announce that I'll be pulling Tris from the App Store on Wednesday, August 27th, to remain in Apple's systems but publicly unavailable until I work out a solution to this. As a result, if you had any interest in Tris, now's your last chance to get the popular game.